Amazon what are you doing? Inside sources suggest that top Amazon management executives are alarmed by the negative internet response towards their acquisition of exclusive distribution rights for Fuji Television’s popular Noitamina anime content. There is worry that the backlash, in tandem with the already narrower availability of the flagship Amazon Instant Video service, will tank their first foray into the anime market. There are concerns over Amazon’s ability to compete with established anime streaming services like Crunchyroll and Funimation, which would hinder attempts to emulate the success of Netflix. Internet trackers within the company have pointed to the younger demographics of anime fans outside of Japan who lack dispensable income, as well as the low sales data and high price points of anime collections sold by Amazon, as factors that may limit the success of the investment. With only one week remaining until Wit Studio’s original anime production Kabaneri of the Iron Fortress premieres on Fuji TV, Amazon has purportedly reacted by contacting Wit Studio representatives (also animators of the ever popular Attack on Titan) about the possibility of producing a Iron Fortress/Attack on Titan crossover special for the Bluray release, that would then also be available to Prime members, in an effort to boost sales. 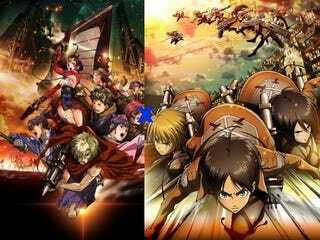 While reports suggest that Wit Studio are agreeable to the arrangement, noting similarities between the two series and thus making adaptation easier, representatives at Fuji Television have found it “disrespectful” as Attack on Titan airs on rival MBS, while Netflix and Funimation, worldwide streaming partners of Attack on Titan, have criticised the move as a “worrying attempt at monopoly” and “damaging for fans”. It has yet to be confirmed how Hajime Isayama, mangaka and creator of Attack on Titan, responded to this new development. Kabaneri of the Iron Fortress airs on Fuji Television beginning April 8th, 2016, and is to run for twelve episodes. Attack on Titan is expected to return later this year. In response to Wit Studio’s recent comments regarding the production of Attack on Titan, which may delay the crossover, Amazon has released a statement on their website.